"You are really building your future and your life with a home like this," she says. "I have led a rather nomadic life while working across Canada and internationally and completing my Master's, it's a big deal to settle down for five years. But this program is set up for young professionals who want to settle in Edmonton, and it seems geared for me. It's a good fit for me and where I'm at in my life right now." Janna will revert to the full mortgage obligation in five years, when she expects to have savings and an income situation that will help her manage the transition. 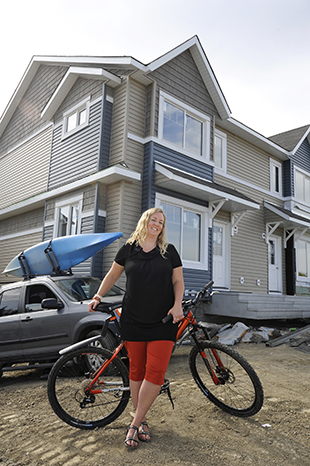 In the meantime she likes the comfort of a new-home warranty on the three bedroom, two-and-a-half bath home, the expectation of a nine-minute commute to downtown Edmonton, and the pleasure of being able to keep her kayak and bicycle with her, rather than parking them at friends' places. For more information on Caernarvon's First Place homes, and other First Place projects planned for Edmonton, please visit edmonton.ca/surplusschools.